BRING OUT THE NETI POT! SPRING IS HERE! As spring arrives and the plants come into flower, pollens can begin to play havoc with allergies and sinuses. Spring colds and flus start spreading around as well. The yogic cleansing practice of “Neti” is a perfect first defense. Neti, or nasal irrigation, is an ancient practice done by Hatha yogis. The sinuses often become blocked or congested, causing problems such as nasal congestion, headaches, ear infections, and sore throats. Since yogis are always concerned with maintaining a healthy body, the cleaning of the sinuses through nasal irrigation has been adopted into their daily hygiene. Dr. Thomas Schmidt, a Doctor of Internal Medicine, performed a research study on the benefits of Neti in reducing the affects of the common cold and other airborne viruses. Dr. Schmidt conducted research over 5 years on the effects of “Jal Neti, or nasal irrigation using water and a Neti pot. He had 115 soldiers in the study. Some were a simply a control group who did not practice Neti at all, while the others practiced neti on an average of one time per day. Some did it two times a day, and the time varied between am and pm. The soldiers kept a diary on how they did Neti and how often. Each soldier had a check-up at the beginning of the study, at the end of the 1st month, and at the end of the 3 month course. At the end of the study, research showed that days missed from work dropped by 70% for the group that practiced Jal Neti daily. [i] Why? Here is how Dr. Schmidt explained it. Nasal mucous membranes have one layer of cells with cilia. On this is a film of liquid. One phase of this liquid is like mucous, and the other is like water. The cilia move like a whip in the water layer, moving a constant flow down to the throat. The same action is occurring in the lungs, only going upwards. The sinuses bring this liquid to the nose, where it can be drained. This protects the body by moving germs away from the cells. The cilia are sensitive to many effects. They become less effective in removing germs when they become too cold, too hot, too dry, too moist, too dusty, etc. Temperature change affects the cilia as well. Gardening and breathing in the dust can laden the cilia with dirt. The first thing a virus does is stop the cilia from working, so they can no longer make the whipping action. It only takes 6 hours for a virus to take hold, and then a virus can infect the cell. If a cell loses its cilia it takes two weeks to regenerate it. All this leaves us vulnerable to the common cold and flu. By performing Neti regularly, it helps the normal flow of cilia, normal flushing and cleansing. Neti works as a defense to keep the cilia functioning when a virus is trying to disable them. This helps to reduce the frequency of colds as well as lower the secondary effects (flu, pneumonia, tonsillitis, ear infections, etc). Neti can also reduce the length of a cold if it does take place. If you are exposed to a virus, Dr. Schmidt suggests you do Neti three times a day so the virus doesn’t have 6 hours to infect your cells. Otherwise, doing Neti once a day should keep the cilia healthy and functioning well. Dr. Schmidt recommends using a ¼ tsp of baking soda to ½ a tsp of sea salt to 2 cups of lukewarm water (body temperature). Ideally, you want the solution to match the salinity of your body, or to taste like your tears. The salt makes it so your body does not try to absorb the water, and the baking soda helps it to match the PH of your body. You may need to adjust the amounts of salt and baking soda up or down until you find the comfortable amount. Fill the Neti pot with the salt, baking soda and water solution. Mix well. Insert the spout into the right nostril and tip your head to the left. The water will pour into your right nostril and come out the left nostril. Be sure to have your mouth slightly open to prevent an air lock. Let the water flow until about ½ the solution is gone, or less if it is too uncomfortable. Blow your nose gently and repeat on the other side. Any stinging sensations will disappear with regular practice. You may also find discomfort being reduced by not doing Neti first thing in the morning – give the sinuses an hour or so to clear after waking. Neti Pots are available from most drug stores and yoga studios. Be sure to measure how much water your Neti pot holds in order to adjust the amount of baking soda and salt to match. Many Neti pots are small and hold less than 1 cup of water so you want to adjust accordingly. I do my Neti in the shower daily. It has become a regular part of my daily hygiene. Caution: It is advised that this practice be learned with a teacher. One may need assistance with the position of the head in order to avoid water entering the wind pipe. If you feel water going down the throat, drop the chin more forward and down. If you feel water going into the ear, reduce the angle of your head. Mugs McConnell will be leading a workshop in Calgary May 26th and 27th at Hillhurst United Church, and May 28th at Yoga MCC for the Yoga Association of Alberta. She will also lead the SOYA 200 hour yoga teacher training in Calgary this coming July. [i] The participation in Dr. Schmidt’s research study is as follows. Yoga for your eyes is important as we use our eyes throughout our days; for work and play. Keeping them focused and fixed for long periods of time on a computer screen, a highway, the television or reading a book causes strain. This also limits our peripheral vision; some of the muscles in the eyes become strong and others lose their integrity. If there is tension, then even a short period of reading can strain the eyes. There are a wide variety of “asanas” for the eyes. The asanas help to neutralize eyestrain and teach us the correct use of all our eye muscles. When we gently and regularly move the eyes in all directions giving them a gentle massage, the six muscles that hold and allow the eyes to move in specific directions are strengthened. Even the effects of aging can be lessened with these simple movements. It is one of the easy stress management techniques that can be done anywhere. Below are a few examples of what you can practice. Contraindications to Practicing Asanas for the Eyes: These exercises are not recommended for those with eye diseases or disorders such as glaucoma, trachoma, cataract, retinal detachment, retinal artery or vein thrombosis, iritis, keratitis or conjunctivitis. If you have these you should only perform yoga practices after consulting their eye specialist. When practicing, the eyes should be relaxed along with the facial muscles, eyebrows and eyelids. After each exercise the eyes should be closed for 30 seconds. The practice of palming may be performed at this time. Glasses or contacts should NOT be worn. 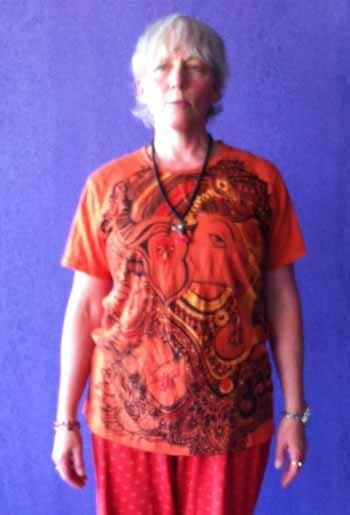 Stand in Tadasana with arms at hips. Balance effort with relaxation as you press your feet into the floor and lift your chest. Keep your breath smooth and release any gripping in your shoulders and neck. Look straight ahead. After a few seconds, imagine that you have eyes on your temples that can see out to the sides. As you breathe, try to perceive what those eyes would be seeing. Don’t pull the images toward you; just let them passively seep in. If you feel a wave of relaxation come over you with this exercise, it’s likely you are holding tension in your eyes and facial muscles all day long. Palming – Benefits: Palming is a relaxing, alpha producing exercise in which heat produced is used to soothe the eyes. Palming relaxes and revitalizes the eye muscles and the entire nervous system. Benefits are enhanced if practiced in front of the rising or setting sun. Never look directly at the sun except for a few initial moments when it is just rising or setting. Usually this is done while seated. Your elbows should be supported (either on a table in front of you or on a thick cushion or two in your lap). It is recommended to remove all rings and watches and wash hands before beginning. Briskly rub your palms together until you feel warmth, charging them with energy. 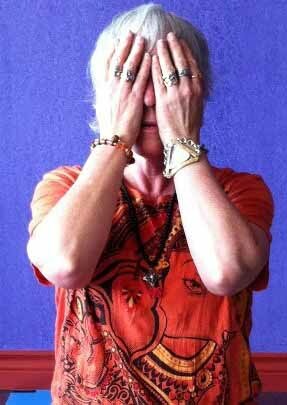 Cup your hands over your eyes so that your palms directly cover your closed eyelids (with no pressure on eyes). Heels of hands rest lightly on the cheekbones and fingers on the forehead. All light is excluded. Concentrate on relaxing your eyelids and releasing all tension held in them. Relax any undue tension in the muscles of the face, neck, shoulders or the rest of body. Recommended to hold for 4-5 minutes. Repeat 3-5 times in succession. This can form a daily practice. When time does not permit a longer practice, this can be done at any time. Even a few moments can keep the eyes refreshed and the mind relaxed. Visualize darkness and blackness. Pay attention to your breath. Notice how the body expands on the inhalation and shrinks on the exhalation. Go through all body parts from head to toe as you continue palming. Front and Sideways Viewing – Benefits: Improves coordination of medial and lateral muscles. 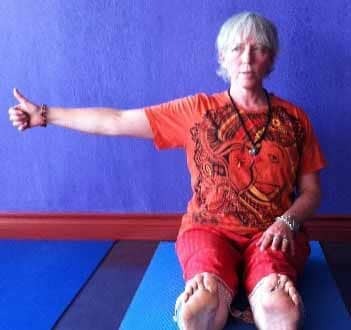 In Dandasana, raise the R arm out to the side at shoulder level, keeping it straight and point the thumb upward. The thumb should just be in peripheral vision if looking straight ahead. The L arm is relaxed with the hand on the L thigh, and the thumb up. Without moving the head, focus the eyes on the following, one after the other. Inhale neutral position; exhale and look down at the L thumb; inhale and look up at the right thumb. Repeat this cycle 15-20 times. Close and rest eyes. Repeat on other side, holding the L arm out to the side and resting the R arm on the thigh. Close and rest eyes. Perform palming here for several repetitions when finished. Modification: If the arm tires, rest on two stacked bolsters. Up and Down Viewing – Benefits: Balances upper and lower eyeball muscles. 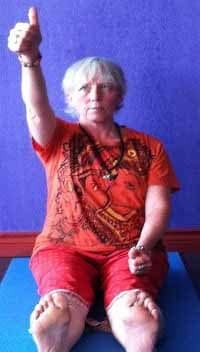 In Dandasana, make tight fists with thumb extended of both hands. Keeping the arms straight, slowing raise the R thumb while following the motion of the thumb with the eyes. When the thumb is raised to the maximum, slowly return it to the thigh, all the time focusing on the thumb without moving the head. Repeat with L arm. Inhale while raising eyes and exhale while lowering eyes. Repeat 5 times each side. Close and rest the eyes. Perform palming for several repetitions. 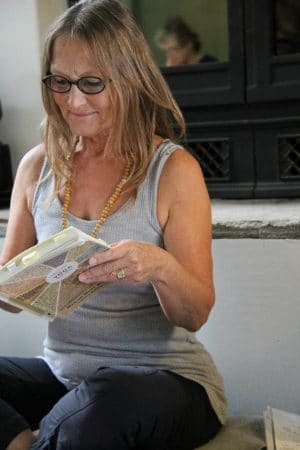 Helen Mikuska is a lead trainer for SOYA’s 200 hour yoga teacher training held in Calgary this July. 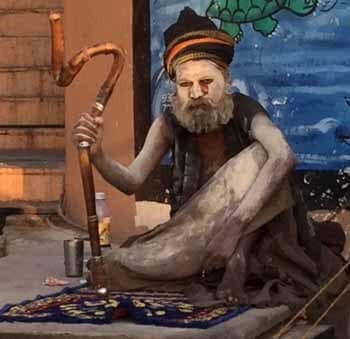 Travelling to India for a temple tour alone at age 74! My trip to India for a temple tour was a bit as I had imagined it, and quite a bit more. I had so many ideas and so much advice given to me before I left that it made my trip more secure, comfortable, and enjoyable. I started my journey on my own. I arrived in the birth village of Krishna – Vrindavan. It could not have been a better choice. Right away I was steeped in the intense spirituality of the place. And there I met a couple of Krishna devotees that took me to Rishikesh and Haridwar. They were wonderful companions and guides. They arranged my plane tickets to Varanasi and Chennai. I stayed in “Home Stays” where I got to meet the families and made friends with them. I visited temples, walked the gats, and assisted in arati ceremonies along the Ganges. The Ganges is so alive. I never felt her as unclean as people think she is. To me she was pure and crystalline… I did not drink her water though, just in case. 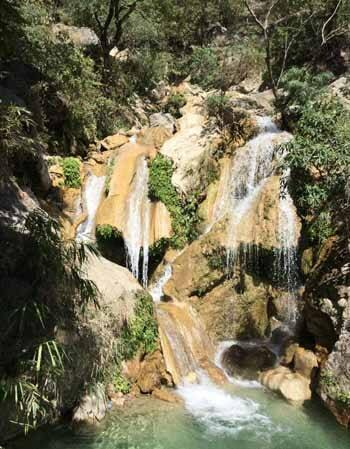 Visiting a waterfall, I felt the water coming through Shiva’s hair, falling on my feet, and refreshing me. I arrived to Chennai where an Uber!!! taxi took me to the hotel to meet Helen and Bev. And there started our extensive tour of Tamil Nadu’s temples. Helen did an extraordinary job preparing a very rich itinerary. We did mantra practices to the gods and goddess for each temple, spending a little time at every stop. We visited big and small temples, and we all agreed we preferred the smaller, more intimate ones. I learned quite a bit about new forms of God, especially relating to the planets. This trip opened new avenues of fascinating studies, and many more ways to worship God in His infinite forms. I owe a debt of gratitude to Helen. 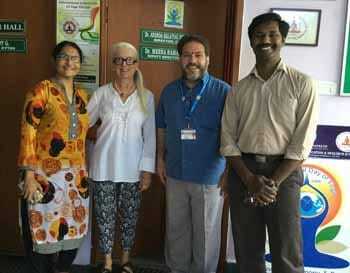 After I left the tour with Helen I headed to Pondicherry, where I got to meet with Dr. Ananda. He gave me a tour of his ashram and the following day he invited me to the teaching hospital where he is instituting a section of yoga therapy into the hospital. I even assisted in part of a yoga class given to patients and staff. I was so moved by his kind invitation and the time he dedicated to me. I would love to register for the yoga therapy course given there…may be one day! Latika (Pierrette Claude) is a SOYA teacher (E-RYT500) who is passionate about the philosophy of yoga and what it offers us. She will be leading the philosophy studies at the SOYA 200 hour yoga teacher training in Mexico this November. Amit on How do I know when my Nadis are Purified?